This year’s PortFest music, arts and community festival promises plenty of entertainment and an all-around good time for residents and visitors who are at Schreiber High School on Saturday, May 17. The event is sponsored by HEARTS (Helping Enrich the Arts), a grass-roots organization whose mission is to add meaningful value to young people’s lives and the community by supporting, promoting and enriching the arts in Port Washington. This will be the third annual PortFest, and it will run from 11 a.m. to 5 p.m., rain or shine. Live entertainment will take place on three outdoor stages, as well as indoors at the Schreiber auditorium. There will be 29 performances, ranging from student organizations, to local bands, to performing artists, to local dance and music studios. There will be 38 diverse family-friendly interactive activities hosted by each of the Port Washington public schools and several local community organizations. One of the largest exhibitions will be the PortFest art exhibit that will boast more than 26 works from various local artists. Also, Larry and Lynn Chrapliwy of Cow Neck Painters will be providing Plein air painting and pastel drawing demonstrations. Featured bands on the event’s two main stages include Bachs of Rock, Empire Road, Little Sammy and the Funked Up Daddies, and Schreiber’s Battle of the Bands winners, Infinity. Every school in Port Washington will have featured performers, plus local performing arts schools, such as Berest Dance Center, and local community groups, such as Port Washington Play Troupe. 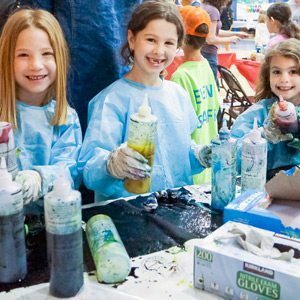 Each of the Port Washington elementary schools will be hosting hands-on creative experiences, including the opportunity to create your own flip flops, make candles and tie dye. Attendees are urged to bring a blanket, chairs and their appetite. Rosie’s Grilled Cheese Truck will serve up specialties, while Delicacies Deli of Roslyn will be grilling burgers and heroes. Crazy Cakes will have a gourmet cupcake truck and Ralph’s Ices will be scooping up ices in their signature flavors. There will be a Silent Auction featuring over 35 different items and opportunities to bid on a plasma flat screen TV, and tickets to Hershey Park, the Book of Mormon, Rocky-The-Musical, a screening of Live with Kelly and Michael, and more. While the day is about family fun and the arts, the ultimate goal is to raise $50,000 to help fund school programs, along with longer-term projects, including funding more grants in 2015, and lending support for the renovation of the Schreiber High School auditorium. Admission to PortFest is free and there is expected to be plenty of free parking at the Schreiber High School campus and surrounding areas. For a schedule of events or for a link to make a donation, log onto www.pwportfest.org. To connect with HEARTS, as a volunteer or to make a donation, log onto www.heartspw.org, or www.facebook.com/heartspw, or email heartspw@gmail.com.